Perhaps a story doesn’t need to get all the facts exactly right in order to capture the creative and spiritual essence of a person’s life. 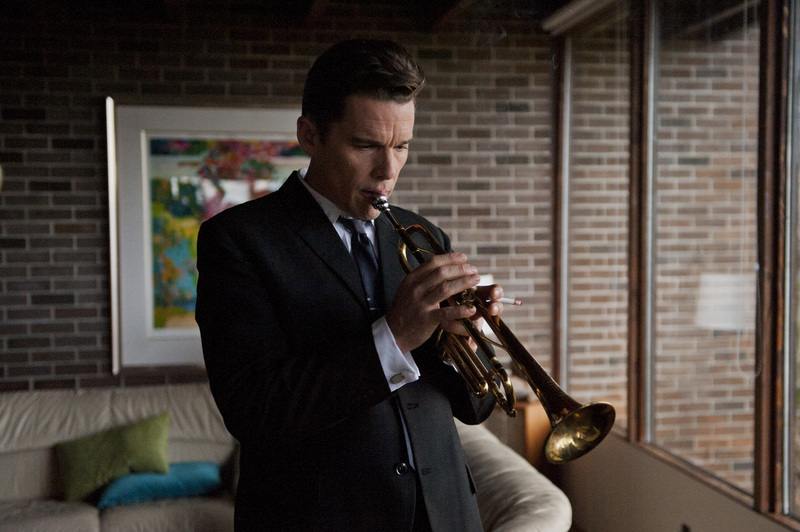 In writer/director Robert Budreau’s new ‘anti-biopic,’ Born to Be Blue, the life lived by American Jazz Trumpeter Chet Baker is keenly interpreted by actor Ethan Hawke in a surreal but gritty performance that tells you all you need to know about the troubled musical genius — renowned as both a pioneer of the West Coast jazz scene and a style icon — who just couldn’t seem to get out of his own way. Born to Be Blue has a tight focus; imaginatively extrapolating several key, true events in Baker’s life, and launching his story at a time in the 1960s when he was struggling to come back musically after years of debilitating heroin addiction. But while drugs were a demon that Baker battled until the end of his life, this movie emphasizes how he never surrendered the passion he had for his art, or his determination to play music at the top of his game (albeit on his own terms). Born to Be Blue opens on a scene of Baker being released from jail, based on an event in the early 1960s, when Baker was imprisoned on drug convictions in Italy, and producer Dino de Laurentiis approached him to star in a movie as himself. While that film never materialized in real life, Budreau uses the narrative device of Baker playing himself in a movie to set a dreamlike tone that accents both the improvisational nature of his music and also the opiate haze of his severe heroin dependency. The movie-within-the-movie is also shot in black and white, for transitional contrast with the ‘real life’ color sequences, which adds to the film’s often hypnagogic feel. Born to Be Blue also takes on Baker’s stormy relationship with romance. While on the movie set, Chet meets Jane (played by Carmen Ejogo) a beautiful and smart actress playing his love interest. The two start a passionate affair in real life, and Jane becomes Chet’s muse, inspiring him creatively and giving him a place to live after he has basically become homeless. Jane’s character isn’t based on any one woman in Baker’s life, but rather she represents composite elements of his wives (he was married twice) and girlfriends into a fictitious female love interest, and Ejogo is vibrant in this role. In 1968, Baker was the victim of a brutal beating from which he lost of most of his teeth. The film’s reenactment has Chet being attacked by drug dealers, to whom he owes money, as he and Jane leave a bowling alley together. Chet’s severe injuries all but completely destroy is ability to play the trumpet, and lead to filming on the movie being shut down permanently. Baker gets fitted for dentures, but physical pain, and frustration he feels at the loss of his embouchure (the use of facial muscles and the shaping of the lips to the mouthpiece of the trumpet) make staying off heroin impossible. Ethan Hawke does a fantastic job of portraying Baker as a tortured artist who couldn’t see his way out of a life of addiction. 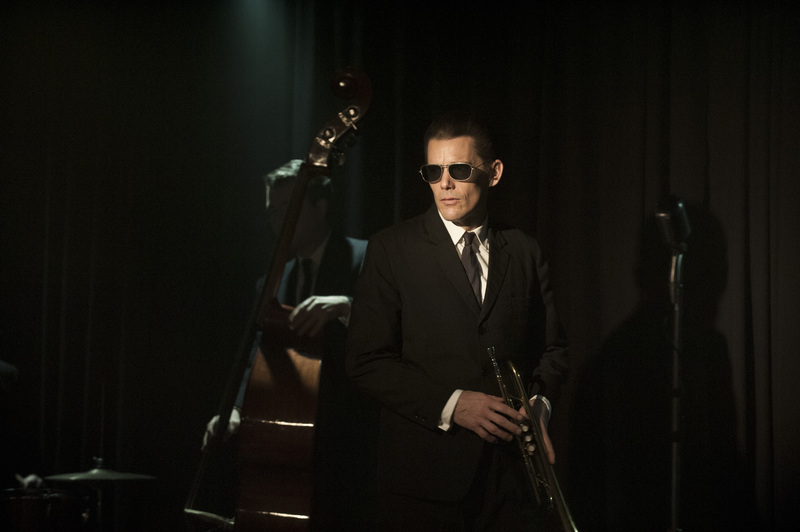 There are many scenes in Born to Be Blue of Chet Baker in the recording studio and also performing live, so fans of his music will not be disappointed. Hawke did all his own singing for the film, while versatile trumpet player, Kevin Turcotte, recreated all of Baker’s trumpet parts (Turcotte also portrays two other jazz trumpet players in the film, Miles Davis and Dizzy Gillespie). The film culminates with the wildly suspenseful and emotionally harrowing retelling of Baker’s comeback show at New York’s famous Birdland Jazz Club, where he’s surrounded by his heroes, peers and fans. It’s not like we don’t already know how the story ends, but Hawke makes Baker’s choice between The Lady or The Tiger: trying to play inspired jazz on a dose of methadone, versus channeling his divine muse with just one more fix, creates authentic dramatic tension while breaking your heart into a million pieces. It’s been said by those who knew Chet Baker that even the biographical documentary, Let’s Get Lost, contains numerous factual inaccuracies. Rather than call itself a definitive biography, Born to Be Blue is more like a love letter to Chet Baker, his ground breaking music, and his contribution to pop culture, despite his status as an unarguably flawed protagonist. As far as what is truth and what is fictitious, the film is comparable to Todd Haynes 2007 masterpiece, I’m Not There; where six characters embody a different aspect of the life and work of Bob Dylan. As long as it captures and honors the spirit of the artist, what else really matters? The Worley Gig Gives Born to Be Blue Four out of Five Stars! Born to Be Blue is now playing in limited release. Visit Fandango Dot Com to find a theater where it is playing in your area. The film will be available via Video on Demand starting March 31st.